On a short jaunt in the woods, food can be dealt with casually, but on a longer trip, getting it right can make the difference between a happy hike and hungry misery. This advice is based on our own experience (with hungry misery), and may or may not be universally applicable. On our current expedition - 4000 miles from Seattle to the Aleutian Islanda - we don't have the option of preparing food at home, and will be eating whatever is in tiny village grocery stores... (macaroni and cheese, probably). But if you have the luxury of preparing hiking food at home, see the recipes below. Here are some Recipes we've used, and below we have a discussion of how we think about and plan our pack food, as well as some useful links. Hiking burns a lot of calories. Exactly how many depends on your weight, how much you're carrying, and exactly what you're doing in a day. Here are a couple websites which will calculate calories burned for various activities. The first lists hiking with different load categories, the second just has hiking and backpacking in general. Based on these estimates, as a 130lb person I burn anywhere from about 350 cal/hr (general hiking or backpacking), to 530 cal/hr (climbing hills with a very heavy load). So if I spend 10 hrs hiking in a day, that would be at least 3500 calories, plus whatever calories are burned in those other 14 hours for basal metabolic activities - say about 1000. So, on a rough estimate, I should burn about 4500 calories in a day of backpacking. Larger people would obviously burn more. That sounds like a lot of food to carry. Luckily, most people (even people in fairly good shape), can get a lot of that energy from their fat stores. After a summer of frequent hiking, Hig and I took a 10 day trip (Seldovia to Homer), where we ate freely but kept track of how many calories we ended up consuming. It ended up being about 2500 calories per person-day, or about half of what those calculators say we should have been burning. We took this estimate, added a bit of cushion to bring it to 3000 calories/person-day, and rationed this amount of food for our 2-month Alaska peninsula trip. What we didn't think about is the enormous calorie difference between what we thought we'd eat and what hiking all day should burn. All that has to come from somewhere, and it was coming off our fat reserves. The upshot of this is that our estimate worked great for the first couple weeks, ok for the next couple weeks, and went downhill from there. By the end of the first month of hiking we were quite hungry on our rations, and ravenously devoured as much as possible at every town we stopped in. For the very last segment of the trip, we bought as much extra food as we could carry in the tiny Port Heiden grocery store, and ate as much as we wanted. This time it came out to about 5000 calories/person-day between the two of us - much closer to the calculated number burned. Currently, I add about 500 calories to the daily estimate (for 2 people) for each week we're going to be hiking. The specific number depends a lot on the metabolism of the people concerned, but it's important to remember that longer hikes require more food per day than shorter ones. Obviously you want the lightest food possible. Here's a link to a quick guide to the calories per ounce of some common hiking foods: Food/Calories per ounce table. Before I go into this, I will add the disclaimer that I am not a nutritionist. The calories in food come from either fat, protein, or carbohydrates. All three of these are important. Fat is the most weight efficient of the three, at 9 calories per gram, and is slow to burn. Fat is found in butter, oils, and nuts. Protein comes in at 4 calories per gram, is also slow to burn, and is needed for building and repairing muscle. Protein is found in meat, of course, but also in anything made of soy, beans, and nuts. Carbohydrates (sugars and starches) also give you 4 calories per gram, and are the quickest to burn - necessary for immediate and short term energy. Carbohydrates are found in any grain, sugar, or fruit. We try to carry as much fat as possible, to minimize weight, and through trial and error have discovered that we can comfortably get about half our calories from fat. This includes our own body fat, however, not just fat in food - so at the beginning of a long trip our food has a smaller proportion of fat than at the end of it. For protein and carbohydrates we haven't figured out an exact ratio yet, but we try to bring as much protein as is practical for its muscle-building properties. On our most recent trek we had about 40% fat calories, 50% carbohydrate calories, and 10% protein calories. For a more in-depth discussion, see this series of articles on hiking and nutrition by Brenda Braaten, a nutritionist and long distance hiker. Water is weight without calories. It's also necessary to survive. On most long trips I've been on, refilling waterbottles is relatively easy, while food has to be carried for a long time. In this situation the food should be as dry as possible to minimize its weight. However, on a shorter trip or a desert trip you might be able to eat all your "wet" food before refilling waterbottles. In this case, the water in the food is just substituting for water you'd have to carry otherwise in bottles, and is not making the food any less weight efficient. Foods that are quite dry include any dried grains and beans, flours, sugars, powdered drinks, dried fruits (these vary in how wet they are), nuts, jerkys, oils and fats, and things like peanut butter and nutella (mostly fat). Foods that are a little wetter include cheeses, jam, lunchmeats, and most breads. Foods on the wet end include pretty much any fresh fruits or veggies. For a short trip in a cold climate, pretty much anything will last long enough to eat. However, for longer trips, warmer climates, or multi-leg journeys where food will be sitting in a post office for months, non-perishable food is key. Perishability can be approximated with water content. The less water something has in it, the less chance that it will rot. Also, animal fats (such as cheese and butter), will go rancid much faster than vegetable oils. For long trips, we make all our cookies with crisco. The backpack is a rough place. Foods that seem perfect based on the categories above (Goldfish crackers, for example), will quickly turn to dust when shoved in a pack. Food for the pack should have as little trapped-air content as possible. 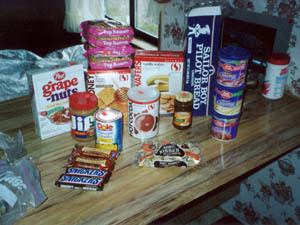 Foods with a lot of air content are more likely to get crushed in a pack, and are also almost impossible to pack efficiently. They may be fine on a weight per calorie basis, but take up way too much space per calorie. This is especially important when you're trying to shove everything into a fairly small backpack, as we usually do. Everyone has different tastes, of course. But I'll say from some unfortunate experiences, that whatever your tastes are, bring as great a variety of flavors as possible. If all your food is sweet, or salty, or all tastes of garlic, you will be very sorry very quickly. There are two sorts of preparation to consider in hiking food - preparation you do at home before the hike, and preparation you do in the field. We tend to do a lot of the former, and very little of the latter. Store-bought hiking foods, such as freeze-dried dinners and pre-packaged energy bars, are the ultimate convenience food. No preparation at home and no preparation on the trip. The downsides to these are that they're very expensive (important when you're poor like us, and are feeding yourself this way for months at a time), and have a whole lot of unnecessary packaging. And despite what they'd like you to believe, freeze-dried meals aren't any more weight efficient than normal dry foods. Energy bars do have a lot of vitamins and minerals that would be harder to fortify your food with in a home kitchen. We usually bring a few of these for that reason. We get most of our calories from home-made ready-to-eat trail snacks, such as different types of trail mix, crackers, bars, breads, and fudge-like substances. This is cheap (we buy most ingredients at costco), and is really convenient once we're hiking. However, some of these things do take quite awhile to prepare, and less variety of flavors is possible than with cooked meals. So we supplement our snack-like fare with some throw-in-the-pot meals. We bring stuff (usually a combination of a fast-cooking grain, dehydrated legumes, and spices) that we can just throw in a pot of boiling water, cook quickly, and eat. To make it really gourmet and higher calorie (dried meals to cook often are short on calories because they have very little fat) we bring olive oil and sundried tomatoes in a waterbottle and pour it on top before eating. Different grains, different beans, and different spices give a great variety of possible meals, the throw-in-the-pot format eliminates the need for extra cooking vessels and supplies, dried grains and beans are really cheap, and hot food is always nice to have. The disadvantages are that cooking takes more time and work than eating snack foods (especially if you're cooking on a fire) and requires a pot to cook in. We choose not to bring a stove and to spend most of our time hiking, so we don't bring much food to cook, but it all depends on your preferences. Ok, so bears are not actually a characteristic of food. But in some areas, they're an important consideration. Hiking in Alaska, we try to minimize the smell of our food to avoid attracting them. Cheeses, fish, and meats are all fairly attractive, so we leave those at home. Also, any time you're cooking, the smells carry much farther than if you were just snacking. If we cook at all, we do it in the middle of the day, far from any potential campsite. 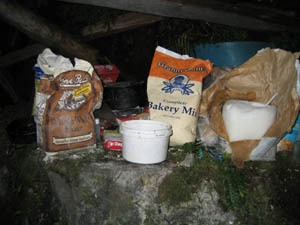 We also store all our food in bear proof kevlar bags made by Ursack, tied to a tree (if possible) while we sleep. The wilderness is certainly not empty of food, and people have survived in almost every region of the world on the available resources there. It is perfectly possible to travel without bringing any of your own food if you know what you're doing. There are a variety of schools, such as the Tom Brown Tracker School, which teach these skills. Even if you don't know enough to survive on wild food alone, it can be an interesting and tasty supplement to what you bring. The easiest things to recognize and gather are fish and edible berries. Some wild greens also make good snacks, but provide few calories. Mushrooms are often tasty, but can be quite tricky to identify correctly. If you're planning on getting a significant portion of your calories from gathered food, remember to allow time for it. Gathering takes a lot of time, and your estimated travel distance will need to be adjusted downward accordingly.